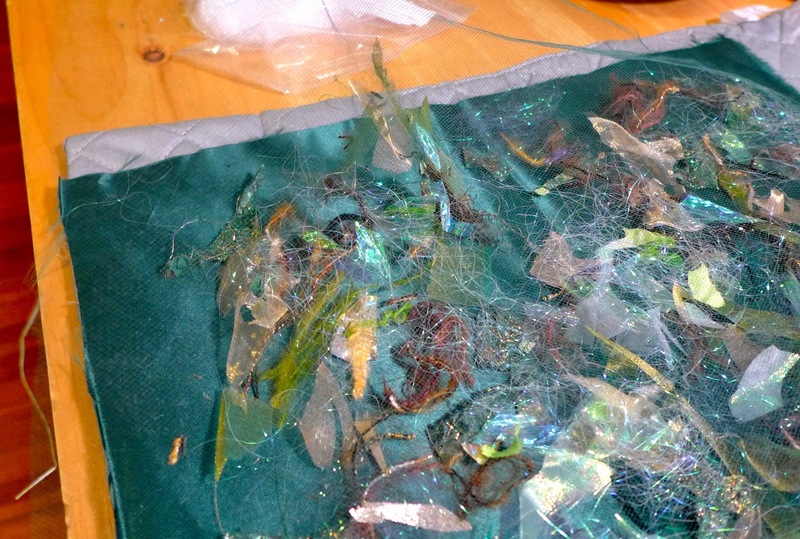 Alright folks, here it is at last, the tutorial for making the gorgeous collage fabric shown above. The pictures really don't do it justice as it has dimension and sparkle I can't capture in a photo but trust me, it is beyond gorgeous. If you have any questions please please post them in the comments and I'll answer as fast as I can. So first the necessary ingredients for this recipe...um tutorial. 1. 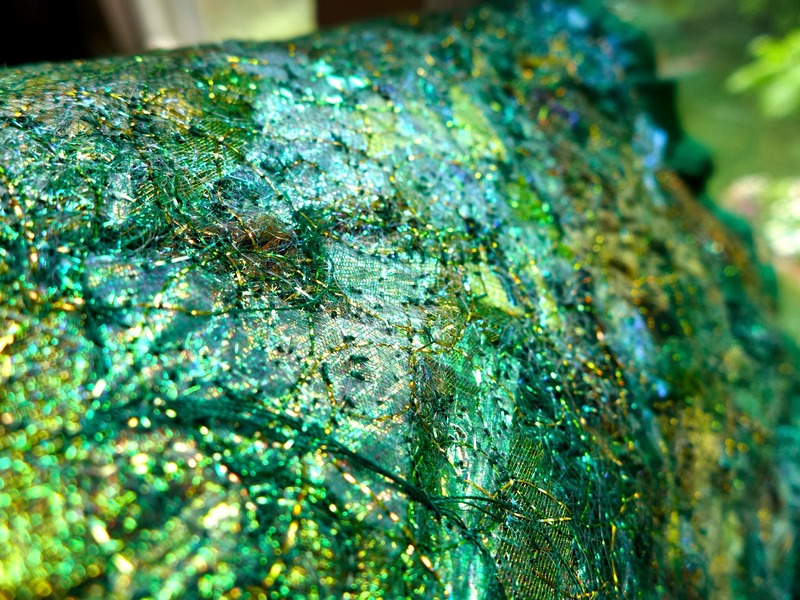 A piece of fabric for the background in the color you want your final piece to be. 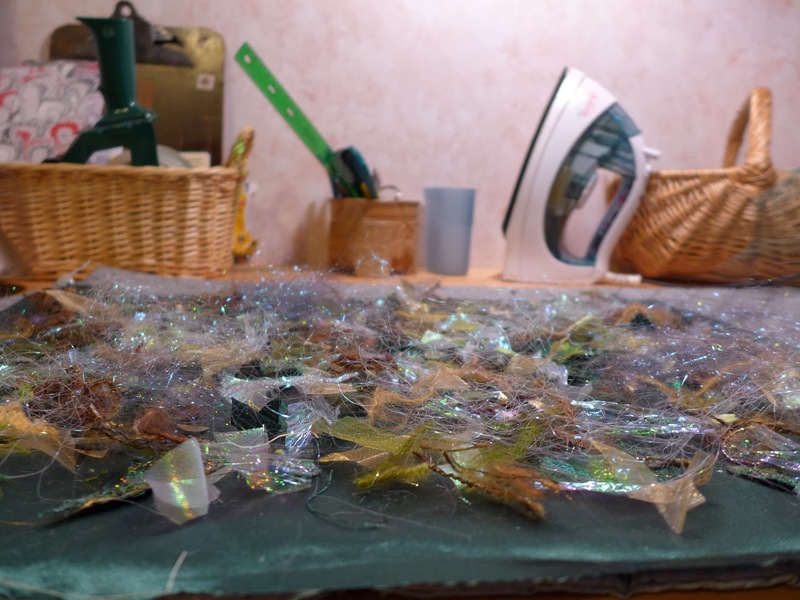 I like to use a satin or some other shimmery fabric. It doesn't really matter as long as it's a substantial fabric. No lightweights for this part! 2. 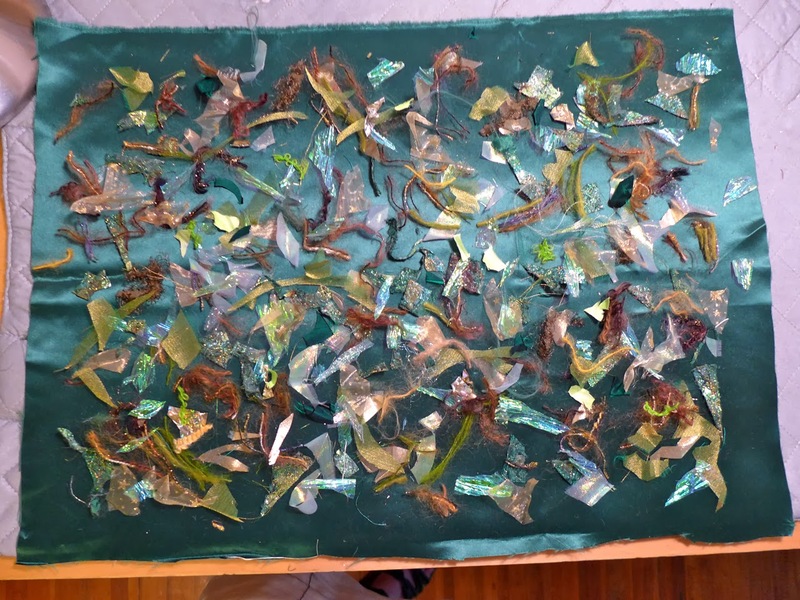 A bunch of scraps to scatter over the top. Go for the glitz here! You can use anything, fabric, lace, yarn, paper...whatever strikes your fancy. 3. 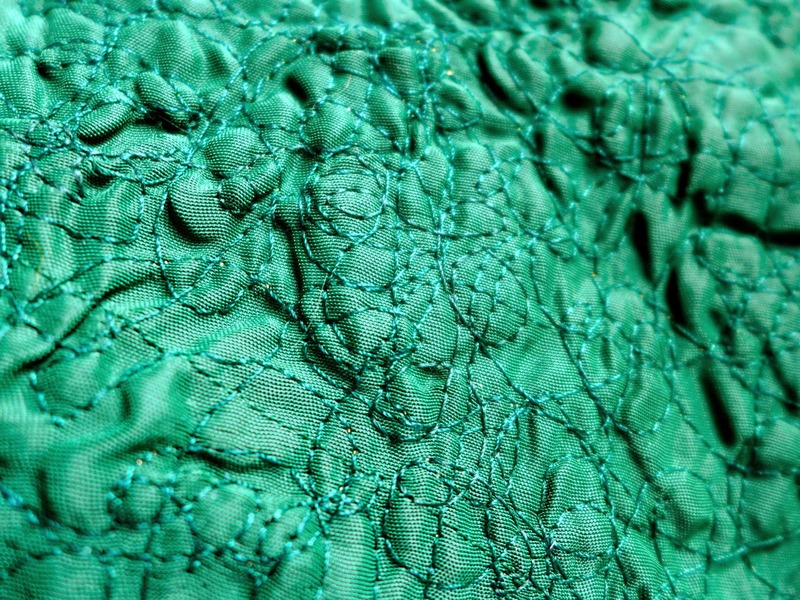 A piece of tulle in a color that matches your bottom fabric. 5. A large piece of plain tissue paper. 7. 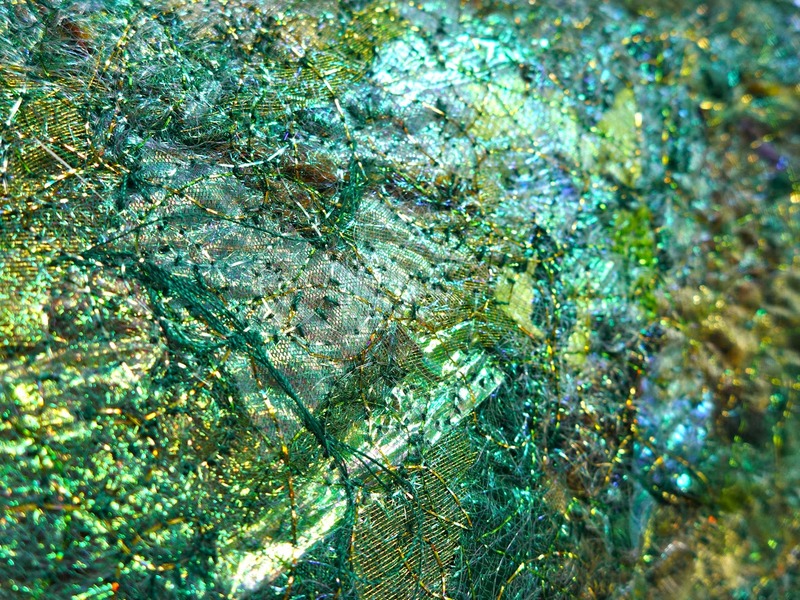 Metallic threads in a variety of colors and a large spool of thread in a color that matches your background fabric. 8. Sewing machine with free motion embroidery foot. Okay now we're ready to start. 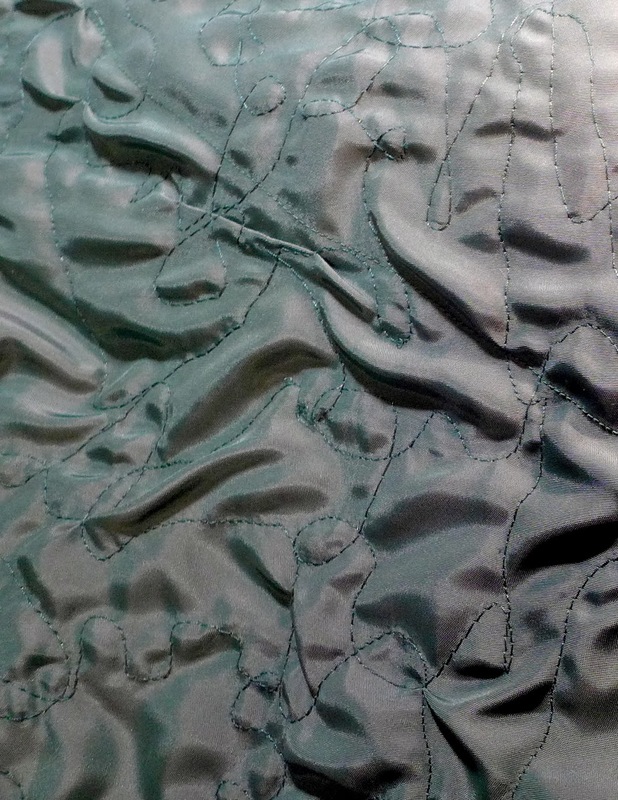 Lay out your background fabric; if satin, shiny side up, and start scattering your scraps all over it. Try to leave a bit of a border around the edges. You will need to iron this later and it's best if you don't have to move it so I place it on top of my ironing pad on my cutting table. A folded towel on top of a table or counter will also work. Next you spread a thin layer of the Angelina fibers over the top. As you can see, I got mine at Joggles but there are lots of places online that sell it now. A little will go a long way too. Now cover the whole thing with the tulle. It's a little hard to see in this photo but it's there! 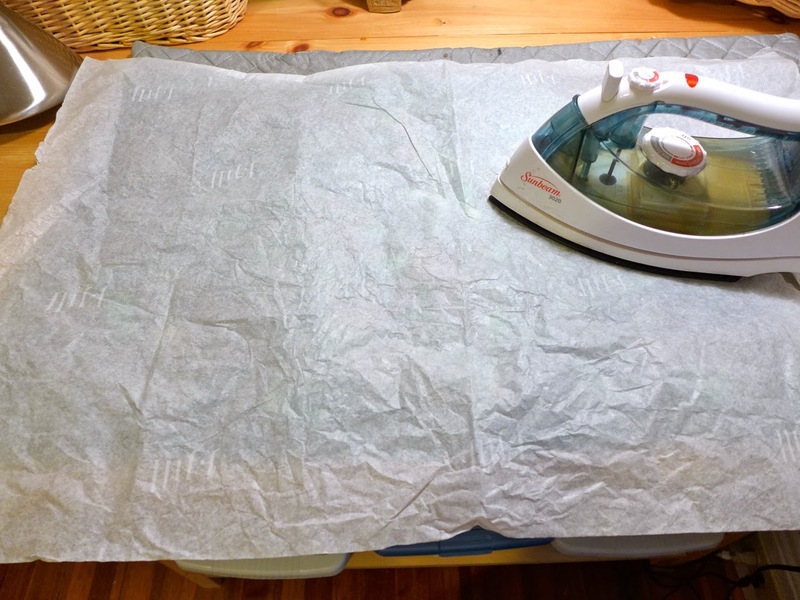 The next step is to cover everything with the tissue paper and iron it with your iron set to a low heat. This will make the fiber bind together a bit and really makes the sewing go a lot easier. They will still slide around a little but that's okay. When you're done it will look like this. Now pin that puppy all around the edges and then sew those edges. Use the regular thread in both your bobbin and on top...that may seem obvious but you'll see why I say this later. I also like to sew a few seams down the length of the fabric just to hold everything in place. Okay here's where it gets interesting. Turn the whole thing upside down. Maybe it's just me but when I tried to do this on top of the fabric it just didn't work. 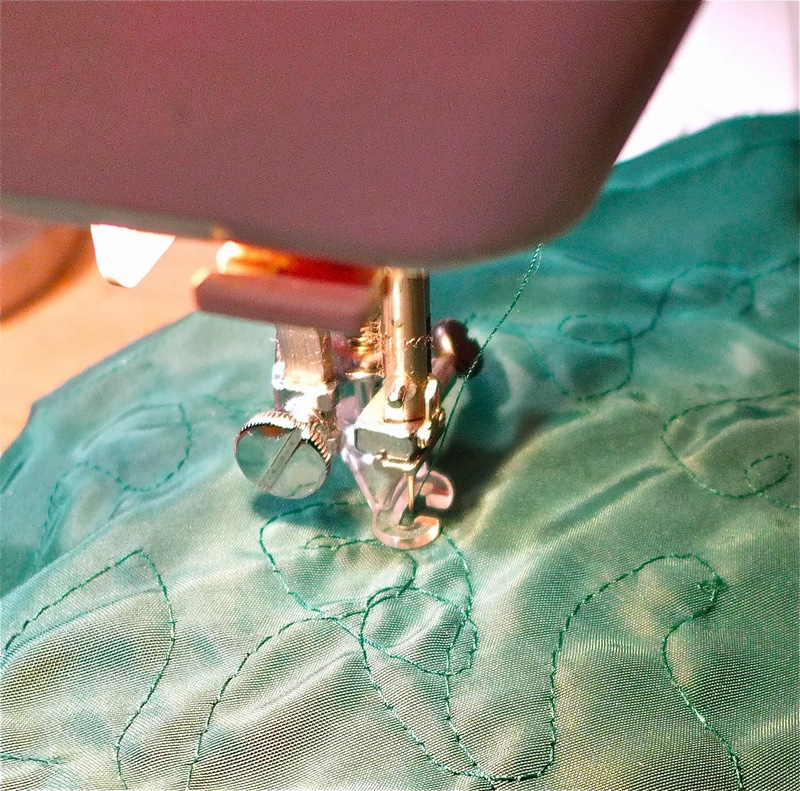 By putting the metallic thread in my bobbin and the fabric thread on top I was able to sew with ease. 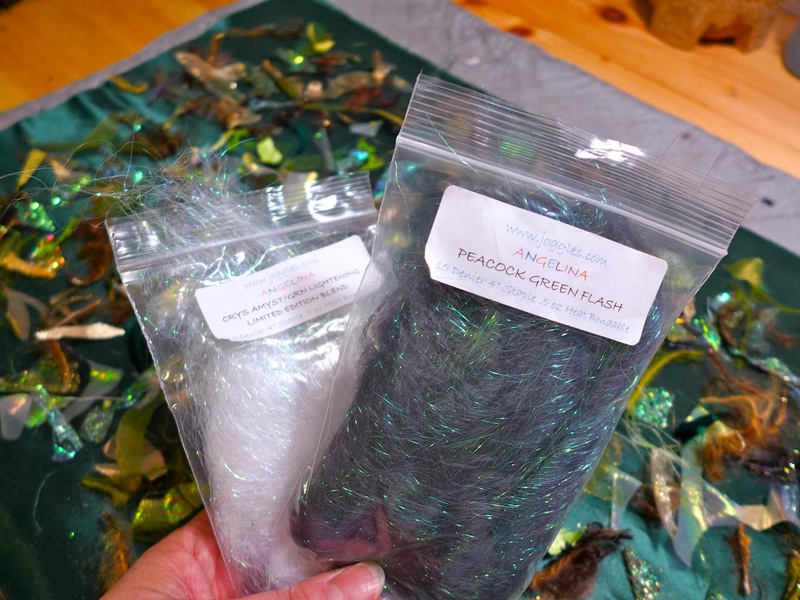 So thread some bobbins with metallic thread, set up your machine for free motion embroidery, put the fabric in upside down, and start embroidering! Go to town here! Loops, spirals, zigzags, whatever strikes your fancy. 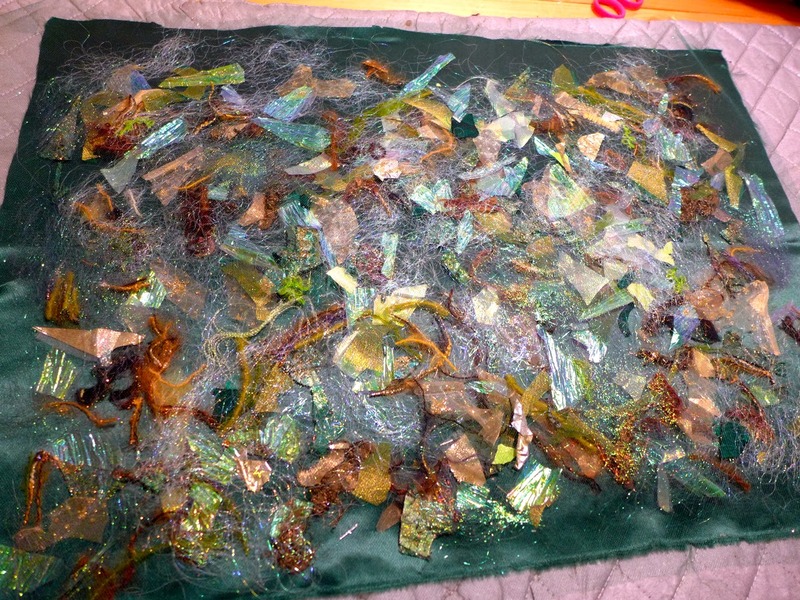 Now the fabric is going to pucker and bunch...you actually want that to happen. Just keep sewing and go right over those bumps. This gives the finished piece so much more dimension. This part takes a Very...Loooong...Time. 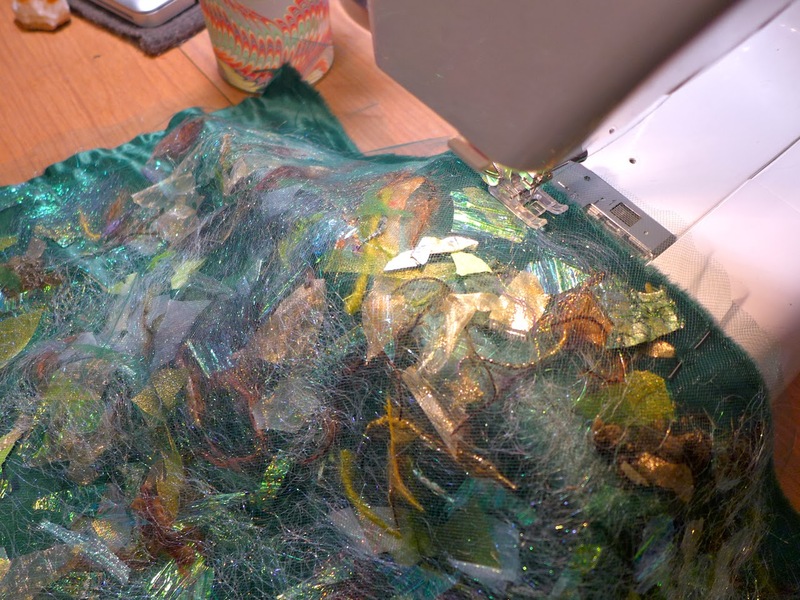 You may want to do it in stages, especially if making a large piece of fabric. Change bobbin colors occasionally for extra glitz. So go...create...and please post links to your finished pieces because I'd LOVE to see them! 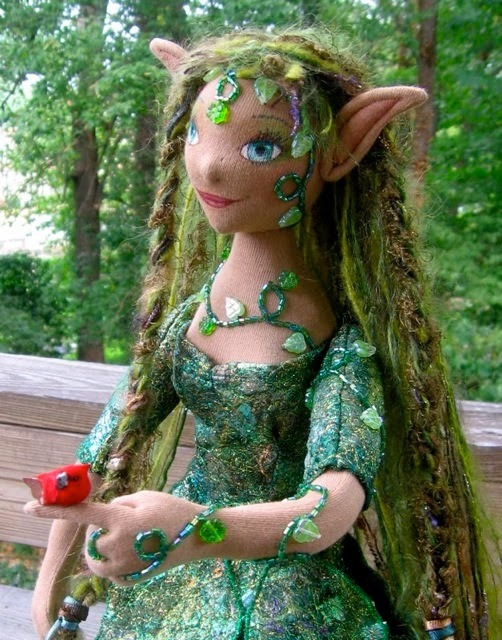 And here's an inspiration photo of a doll I made, dressed in this material. Amazing! What dedication to your craft!! Love to see it done in purples!! Nora sent me this. I love fairies. What is your shopping cart url?